The Debit Dawg Account will be administered by the ID Card Office, which is located on the second floor of the Student Center. Normal hours of operation are Monday through Friday: 8:00 am – 4:30 pm and the phone number is 618/539-3351. Cardholder understands and agrees that the Debit Dawg account is not a credit account and that under no circumstance may debit or charges to the account result in a balance below zero. The Debit Dawg account may not be used to obtain cash or cash advances under any circumstances. Debit Dawg accounts are initially established with a deposit. Deposits to your “Debit Dawg” account may be made in person at the Business Office window located on the second floor of the Student Center, by mail, online using SalukiNet, or over the phone using VISA, MasterCard, Discover, or American Express by calling the Business Office at 618/536-3351 during regular business hours. 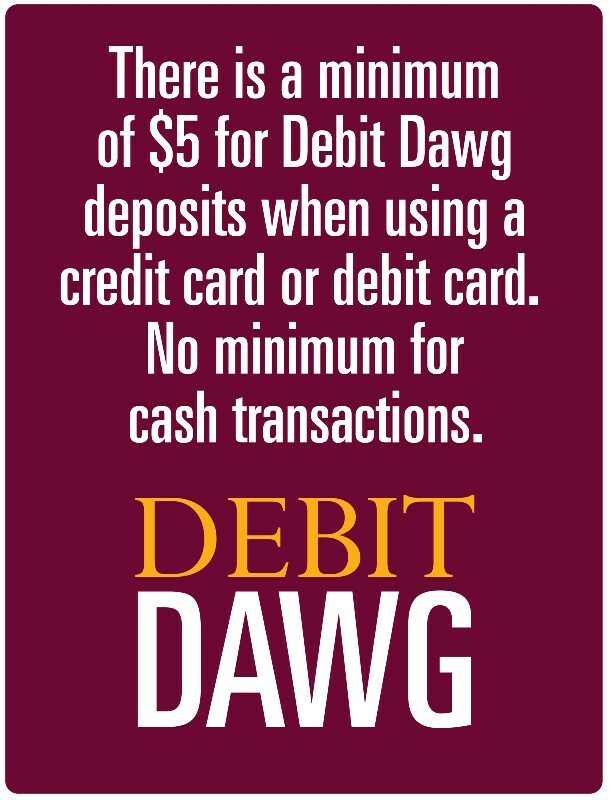 There is a $2 ‘Convenience Charge’ on all phone generated credit card deposits to Debit Dawg. Funds deposited in person or over the phone will be available within the hour. Funds deposited through SalukiNet will be available the following business day. Funds may also be added at any of the Debit Dawg cash machines located in Lentz, Trueblood, Mae Smith Hall, and University Halls, Student Services Building (1st floor), Student Center ID Office (2nd floor), Morris Library, Law School, and Faner Computer Lab (CLC1). Your personal account may be used only by you. Please include the SIU ID number and name of the account holder on the check (payable to SIU) and mail to “Debit Dawg”, Southern Illinois University Carbondale, Student Center ID Card Office, 1255 Lincoln Drive, Mail Code 4407, Carbondale, IL 62901. Checks returned marked “insufficient funds” will result in a hold being placed on the Cardholder’s “Debit Dawg” Account. A returned check must be replaced with cash in the Debit Dawg Office, and a $25 returned check penalty will be charged to the Cardholder’s bursar account. The penalty charge is subject to change without prior notification. Cardholder understands and agrees that no interest or other earnings will be paid to the Cardholder or credited by SIU to the Cardholder’s account. Cardholder may check recent transaction history and balance at idcard.siu.edu by logging in with their SIU netid. The SIU identification card is the only access device to the Debit Dawg Account. This card must be presented to the cashier at the time of purchase and is the only way of accessing the Cardholder’s account. This account is non-transferable. The Cardholder may pay for a guest’s transaction by way of his/her account, as long as the Cardholder is present at the time of the transaction. The card will be confiscated if found to be used by an unauthorized individual. Debit Dawg Account may be used at the locations listed here. Your card may be inactivated or activated on-line by using SalukiNet. Cardholder is responsible for safeguarding his/her ID card. Should a card become lost, either accidentally or by theft, SIU assumes no responsibility for illegitimate purchases from the Cardholder’s account prior to the Cardholder notifying the ID Card Office by calling 618/536-3351 during the posted operating hours, or by stopping by the ID Card Office, 2nd floor of the Student Center or by calling the Department of Public Safety 618/453-3771 after normal ID Office Business Hours to report the card as lost. Lost or damaged cards will be replaced by the ID Card Office upon the Cardholder’s request. These replacements will be made in accordance with existing ID card policies. The price of the replacement ID is $25. Cardholder agrees to abide by all laws, SIU rules, regulations, policies and procedures. SIU reserves the right to cancel this agreement in the event the Cardholder violates any such rules, laws, regulations, policies and/or procedures or breaches in any way any term or condition of this agreement. The “Debit Dawg” Account will be closed automatically in due course if the Cardholder ceases to be a student, faculty or employee of SIU. An account may be closed or refunded upon request or as outlined by the conditions in Effective Date of Agreement, or at the end of the current semester. This request must be made in person or from the student’s SIU email account to debitdawg@siu.edu. At the time the plan is closed, (upon verification of official separation from SIU) the “Debit Dawg” Office any remaining funds may be credited to the Cardholder’s Bursar account if the account contains more than a $10 balance. Accounts less than $10 must request a refund and will not be refunded to the Bursar automatically. Goods and services purchased and debited to the “Debit Dawg” Account may be returned subject to return policies at the location where the purchase was made. If such a return is permitted, the Cardholder’s account will be credited for the appropriate amount. The Cardholder understands and agrees that no cash refunds or withdrawals may be made to the Cardholder. Cardholder must telephone 618/536-3351 or send an email as soon as possible, if Cardholder believes there has been an error in connection with the Cardholder’s account. All email communication must come from the cardholder’s official @siu.edu email address. Such notification must include: Cardholder’s name and SIU ID number, description of the error or the transfer in question, an explanation of items believed to be in error and the dollar amount of the suspected error. If notification is made orally, SIU may require that the Cardholder send the complaint or question in writing within ten (10) business days. SIU will inform Cardholder of the results of its investigation within ten (10) business days of the date SIU receives notification from Cardholder and will promptly correct any error. If SIU determines that there was no error, SIU will send Cardholder a written explanation within three (3) business days after the conclusion of its investigation. Cardholder may ask for copies of the documents that SIU used in its investigation.